Q: What is the best age to see an orthodontist? A: The American Association of Orthodontists recommends every child see an orthodontist by around age 7. However, in actuality any age can be the right age if you want to improve your smile and your confidence. Q: How long will it take to straighten my teeth? A: Each patient has a unique set of teeth so depending on what we need to do will determine how long treatment will take. Sometimes in can be as short as a few months and other times a few years. Q: Is it true that I can’t eat certain food during orthodontic treatment? A: It depends what sort of treatment you are undergoing. With braces, it is true that there are certain foods we ask you not to eat. We can review them when you get your braces put on, but generally we ask you to avoid excessively hard, sticky and crunchy foods. Q: Will braces interfere with playing an instrument? A: Most patients adapt very quickly to playing their instrument while wearing braces. It may be a little different at first, but it should become normal very quickly. And if the instrument you are worried about is a guitar or the piano, we should probably talk about this in person. Q: Now that I have my braces, do I still need to see the dentist for cleanings and checkups? A: Yes. Yes. Yes. In fact, it is actually more important than before you had your braces. Food can get caught in places that your toothbrush has a hard time getting to. Your dentist will work with you and your orthodontist to make sure your teeth and gums stay healthy. A: Not really. 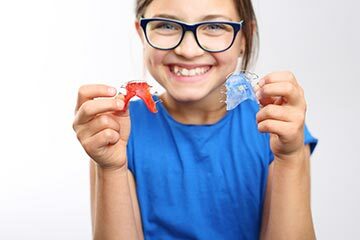 Everyone feels different sensations while undergoing orthodontic treatment though so it is hard to tell what each person experiences. However, your teeth, gums and cheeks will get a bit sensitive for a few days after your visits to us. A: The cost of braces depends on each patient’s unique treatment plan. We will review all the costs of treatment before we get started and discuss our no-interest payment plans. We will also contact your insurance company on your behalf to determine what your orthodontic benefit may be. Q: How do you spell Invisalign anyway? Q: Are you an Orthodontist near me? A: Our office is conveniently located in the heart of downtown Portland near Pioneer Courthouse Square, Powell’s Books and the infamous food carts.